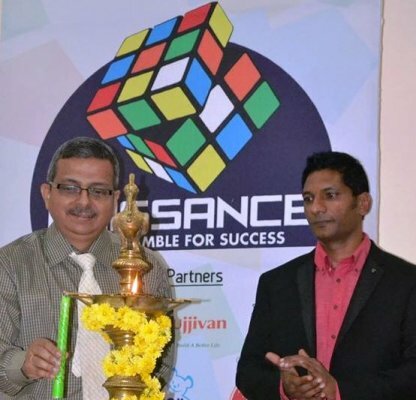 Naissance, the Student managed flagship management fest of SDMIMD was inaugurated by Mr. Girish Karunakaran, Vice President of Eurasia, Software Paradigm International (SPI). The 3-Day event scheduled during January 29 to 31, 2015, is the arena wherein the brightest minds from the best B-Schools across India battle it out to attain supremacy in intellect and creativity. This year the theme ‘Unscramble for Success’ emphasizes the need for synergy and distinctness among managers to enable them, make the right moves at the right time to scale greater pinnacles in this scrambled world. Mr. Girish Karunakaran in his inaugural address to the young minds gathered stressed on the role of youth towards building the nation. Speaking about the entrepreneurial initiatives in the country, which is steadily growing over the past few years, he called upon the young managers to build their career and provide employment to others as well. Dr. N.R. Parasuraman, Director, SDMIMD welcomed the gathering and appreciated the effort and managerial acumen of SDMites in making Naissance 2015 possible. Over 180 students representing B-Schools across India participated in this event. The participants had chance to showcase their managerial acumen in various events organized at Naissance 2015. ‘Daayitva’ the Corporate Social Responsibility event was won by team ‘Sharpeners’, from the CSR Centre of Excellence, comprising Gurunandan Rao M, Sahana V.P and Jagadeesh P.H. The finance event ‘VittArohan’ had team from Loyola Institute of Business Administration, comprising Chathurya P and Geetha P.J as winner. The team from XIME Bangalore, comprising of Nupur Malpani and Moumita Mahapatra won the Human Resource event ‘Carpe Articulum’. The team from LIBA won the marketing event ‘Markethor’. Oscar D’Souza and Evans Thomas represented LIBA for the marketing event. ‘Impendence’ the Operations event was conquered by Nimish Halkar and Libin George representing Christ University. Another team from Christ comprising of Sharan Jawalkar and Devesh Sharma won the Systems event - ‘Lucifer’s Ultimatum’. The B-Plan competition organized by SDMIMD E-Cell – Swayam was very encouraging. The team from Goa Institute of Management - findadspot.com comprising of Mr.Ankur Jhunjhunwala and Mr.Suneet Dashora emerged as winners of this event. Xavier’s Institute of Management Bangalore emerged as Overall Champions of Naissance 2015 for their performance in all the events organized in this 3-Day management fest. Mr. Rakesh Babu , Director, Innomantra, was the Chief Guest for the valedictory function. Mr. Rakesh Babu addressed the gathering and handed over the prizes to the winners of the various events. The audience was thrilled and cheered the winning team of XIMB when it received the overall trophy from the chief guest.